I wrote in April about the case brought by film-maker Neville Presho, whose holiday home on Tory Island had disappeared in his absence, replaced by a car park for an adjacent hotel. At that stage, Mr Justice Murphy suggested that there may be a restitution claim for the hotel’s use of the site as a car park, and adjourned the case to receive submissions as to remedy. He gave judgment yesterday (Belfast Telegraph | Irish Independent here and here | Irish Times | RTÉ news). Murphy J held that an equitable remedy lay not in the re-instatement of the original property but in the provision of a comparable dwelling on this island or its market value, and he adjourned to October the issue of which of those options should be chosen. And so we must wait some more to learn whether the remedy really is restitutionary or whether it is founded upon more general considerations. The reporting of this case is somewhat confusing. Has the hotel succeeded in establishing adverse possession over the land in question? If not, what (apart from possible planning difficulties) would prevent the plaintiff from rebuilding on that site? Why the focus on the provision of a comparable dwelling *elsewhere* on the island – unless the claim also encompasses the value of the land to the hotel into the future? does not the “footprint” of the house that once stood not still belong to Neville Presho and if so then he is entitled to ask that the hotel carpark be removed from that area. has Neville Presho established ownership of that footprint and if the cout verdict confirms that then he can fence off that area. The hotel can pay him if it wishes to continue using that space. Hi guys. Thanks for your comments and speculation. The newspaper reports, unsurprisingly, concentrate on the ‘human interest’ aspects of the story, so the legal issues you raise can’t be properly addressed until we have a full written judgment, and its continuing absence is a source of frustration. how long was he gone for? He was gone for eight years, according to the media reports, but that doesn’t change the fact that he owned his house. 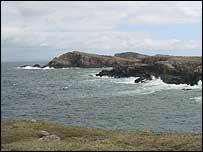 Great photos of Tory Island on your site, btw. thx mang but cmon did he really expect it to still be there after 8 years waiting for him. there already isn’t much room for houses on these islands so the last thing you want is some waste of space like ..
And you paved paradise to put up a parking lot…. This is kind of sad. Beautiful pics though.